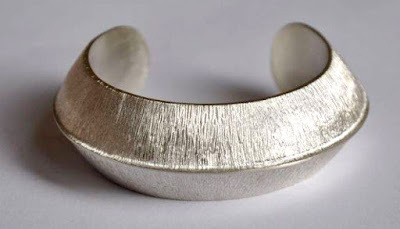 Folded Precious Metal Jewelry for Bold Wearable Art. Simplicity That's Modern, Striking & Architectural. 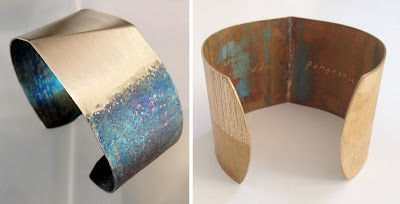 I don't usually use architectural to describe jewelry, but there is no more fitting word for the stunning folded metal pieces by Frieda Pangestu! It should be no surprise that Frieda's background is in design. She has a very modern and striking aesthetic. I love how she translated her skills to silversmithing because she wanted to spend more time working with her hands. Now she makes wearable art, little sculptures that double as necklaces, earrings and bracelets. Each piece is hand forged to yield bold lines and curves. Dress up a simple outfit with one of her statement necklaces. Some of the most unique pieces in her collection involve an age old Japanese technique called mokume-gane. It's an amazing process of folding metal over and over to create a one-of-a-kind pattern. The art is in how you work the metal to reveal its true beauty. Her other key collection is based on creases, creating the structure in her jewelry. The perfection of Frieda's lines shows how much work she puts in to polish each piece. These necklaces, earrings and bracelets could be in a museum, but it's more fun to wear them and show them off!